Smart Frame is a modern system of textile stretching. It is composed of aluminium frame and high quality graphics printed on textile. Edged with silicone rubber the textile allows easy and fast inserting it into a frame. Part of profiles is dedicated to backlighting both from the back and edge. Wide range of profiles for the design of frames is the advantage of our system. High quality latex and sublimation print guarantee perfect quality of graphics. 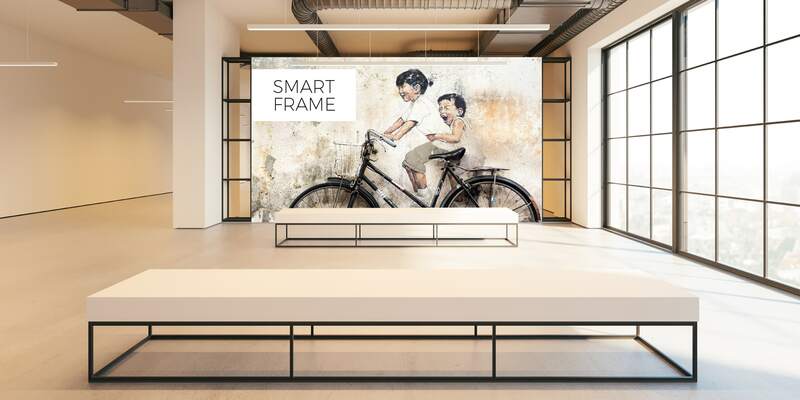 In practice, Smart Frame is not limited by dimension; frames may be narrow, as well as wide and decorative, becoming an aesthetic element of decoration. Smart Frame is a modern system of textile stretching. It is composed of aluminium frame and high quality graphics printed on textile. Edged with silicone rubber the textile allows easy and fast inserting it into a frame. Part of profiles is dedicated to backlighting both from the back and edge. Wide range for the design of frames is the advantage of our system. Smart Frame in public spaces is distinguished by intensive colours, backlight and most of all the spectacular large formats. Smart Frame conveys information, advertises, communicates, and presents art, on permanent or temporary basis. It gives unlimited possibilities of use in arranging large spaces. Smart Frame textile stretching system will perfectly work out in variety of conferences, exhibitions, fairs, galleries, promotional booths in shopping malls and POP and POS points, that is wherever it is important to find customer’s interest, present the products or offer free samples. The wall made of frame and Smart Frame textile may be successfully used as a “background” at exhibition booth.